With Valentine's day fast approaching, it is time to focus on love, healthy foods and fun filled products to make your day as sweet and delicious as possible. From fantastic lip treatments to carb free meals, dark chocolate skinnychews and chips that are actually healthy – this newsletter has a little something for everyone. Don't forget, if you have not joined our CityLine weight loss challenge, it is not too late to start! Simply click here to get the ultimate start up package to begin looking and feeling your very best (and be bikini ready by spring!). Finally... you don't have to feel guilty about eating chocolate! My dark chocolaty Skinnychews have less than 20 calories per chew, have 4 grams of pre-biotic inulin fiber and are gluten free! The perfect option for 3pm or afternoon cravings. 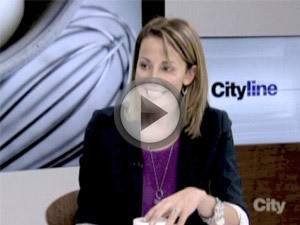 Check out how our CityLine weight loss gals are feeling better, burning belly fat and losing inches! Sugar Lip Balm with Moisturizing Tint - This lip balm is my new favorite find. It is extremely hydrating for winter and gives your lips a nice, healthy tint. Sugar lip balm comes in a variety of colours and flavours and has been found to leave your lips moisturized for up to 6 hours after application. I admit it – I have a goat's cheese problem! Whether it is on my salad, in creamy tomato soup (see below) or in my eggs – I cannot get enough. One of my favorites is Woolwich dairy's traditional chèvre, coated with a perfect mixture of fine herbs. Pacific Organic Creamy Tomato Soup – When I am out of time at night, but looking for a homemade feel, I turn to this creamy option. Simply Protein Chips – Simply protein chips were sent to our office last month and we absolutely love them (my staff is eating all of it!) The pea protein used in this tasty snack provides 15g of protein per serving. The crunchy texture of these protein chips offers a healthy satisfying mid afternoon snack option with enough protein to keep you full. Not only are strawberries delicious and refreshing, they also contain a high antioxidant content and are packed with nutritious vitamins and minerals. Frozen of fresh, strawberries are the perfect fruit to throw into your smoothies or yogurt or in a salad at lunch. The numerous benefits offered by strawberries include booting immune system function (due to their high vitamin C level), reducing inflammation and being low on the glycemic index (therefore good for diabetics and weight loss). Half a cup of strawberries contains only 24 calories, 2 grams of fiber and 6 grams of carbohydrates. This is a great recipe to bring to a party or to have out at your house for the kids. Pair with some cut up veggies and healthy crackers for dipping. Mash ingredients together in large bowl. Taste and adjust lime and/or salt to suit your taste. Melt the dark chocolate in a bowl set over a small pot of simmering water. Impale a strawberry with a fork and dip it into the melted dark chocolate and then immediately roll in your choice of coconut or almonds. Lay on a baking sheet to set and place in the fridge for an hour. In a medium size bowl combine breadcrumbs, grated parmesan, garlic powder and salt. On a baking pan lined with tin foil, spread a fresh bed of shredded lettuce. Distribute meat, olives, chopped tomatoes, green onion and any additional toppings. Sprinkle with cheese. Heat oven to 350 and broil for 3 minutes or until cheese is bubbling. Serve with guacamole or low fat cottage cheese or sour cream if desired. Peel and cut 1 banana down the center. Optional: For a frozen treat, close the banana with the fillings inside, wrap in tin foil and put in the freezer for the next day. "It's All Good" was written when Gwyneth Paltrow was told that she would have to undergo a complete elimination diet to help support her anemia, vitamin D deficiency and high stress levels (no wheat, dairy, eggs, coffee, soy or gluten!). The book is filled with over 185 recipes that Gwyneth turns to when she wants to boost her energy, lose weight and get "red carpet" ready. Recipes include: Huevos Rancheros, Hummus Tartine with Scallion-Mint Pesto, Salmon Burgers with Pickled Ginger, even Power Brownies, Banana "Ice Cream," and more! Great job Gwyneth – we love it! "I have more energy and I no longer need to take my stomach meds. I see this as a real lifestyle change." We are so proud of all our clients and are thrilled to offer hormonally balanced weight loss programs that are personal and private. If you would like to book an free initial assessment with Dr. Joey, please contact (905) 889-5326 or email us at inquiries@shulmanweightloss.com. You can also visit our website at shulmanweightloss.com. Assessments are offered at our Thornhill, Avenue Road and London offices (London office is now open Saturdays! ).